I hope this movie is completely unrealistic because if it isn’t, it’s the scariest movie I’ve ever seen in my life! 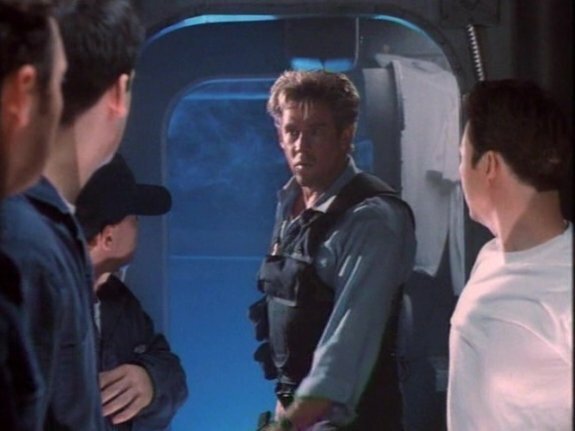 A group of terrorist made up of four guys and one gal manage to take control of the awesomest nuclear armed submarine in the whole U.S. fleet! And they accomplish this only after putting into action the single dumbest plan in the history of submarine hijackings! They send out a mayday signal in the middle of the super stormy ocean and the good-hearted, but too trusting sub captain hears the distress signal, and surfaces to take them aboard! Obviously for the plan to work, the five terrorists had to hope that they wouldn’t drown in the storm first. Then they had to hope there was a sub nearby (maybe that was accopmlished by the traitor they had on the crew, but would he have known exactly where they were going soon enough ahead of time to set all this up?). Then they had to pray that the sub would actually pick them up. And finally they would have to get beyond lucky that once aboard the sub they wouldn’t be confined to quarters and would have free run of the ship and be able to overpower everyone they ran into until they obtained the ship’s weapons. And that doesn’t even address the cliched extortion plan that all these Eurotrash terrorists try and fail at! When the admiral gets word that the sub has been taken over and receives the terrorists’ demands, he was probably (like the viewer) already mouthing the various threats and payment conditions along with them. One hundred million dollars in gold delivered to some coordinates before a certain amount hours or they launch one of the sub’s nukes at Washington D.C. We all know the drill – get me the president! What assets do we have in the area? Go find James Carter! James Carter? You mean ex-president Jimmy Carter? What’s he going to do? Criticize Israel and offer to build the terrorists a house? Heck no! Did your mama crash dive you on your head when you were little! They mean James Carter – the guy who designed the submarine! The guy who is an ex-Navy SEAL! The guy who was one of the best Navy SEALS! The guy played by Michael “the Dude” Dudikoff! The plan is so simple and elegant (meaning it’s Die Hard on a sub!) you can’t wait for some variation of it be used again in another of the Dude’s submarine films, Counter Measures! The Dude will be dropped into the ocean by helicopter, picked up by another sub, taken near the captured sub, swim over to the captured sub by himself, get aboard, and stop the terrorists from nuking Washington! But first he has to be convinced! He doesn’t want to do it (for about 10 seconds) because he has a son (the mouthy Tommy) and his wife is dead and he doesn’t want Tommy to lose both his parents! But Tommy overhears and tells the Dude that people are needing his help and to get the action scenes in the movie going already! 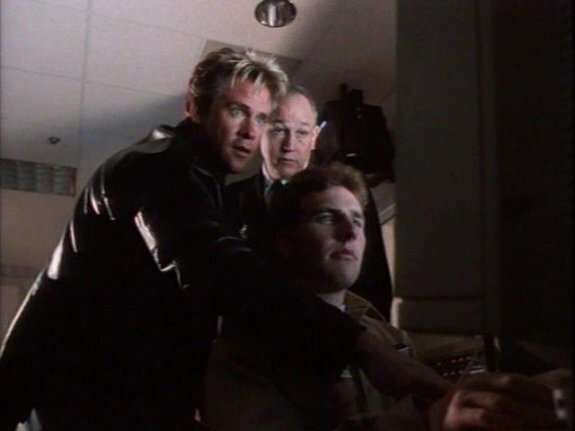 Next thing you know, the Dude is feverishly trying to use a laptop to set new cooridnates for the missiles, brawling with scuzzy bad guys, and trading taunts over the radio in the sub with the lead terrorist! 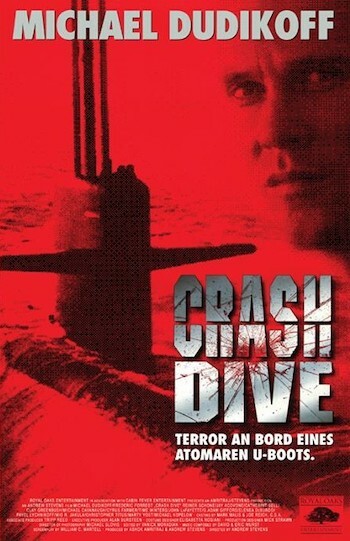 Crash Dive is a movie that will satisfy the two types of viewers it is aimed at. For the viewer who was never in the military and knows nothing about submarines, it succeeds because guys in khaki outfits are running around little compartments yelling things like “on my mark!” and “release counter measures!” It fits exactly the image I have of life on a sub, but without all the weird stuff that probably goes on in the shower! For fans of the Dude, it works because the Dude is in full command of all his abilities. His hair for instance is a lusciously piled blonde heap of studliness. He’s a great dad who treats his kid really nicely in the 5 minutes of scenes they have together! And he beats people up, impales them on pipes, sprays fire extinguishers in their face, throws them off balconies to their death and shoves a guy out a hatch into the ocean to drown! He even blows some stuff up! The movie even accomplishes the difficult task of being suspenseful while causing you to chuckle! In a pointless double-cross, the terrorists change their mind and decide to nuke New York City instead. But we all know that Tommy and his aunt are going to New York City to see the Empire State Building! What are the chances that they’ll be right there when this missile comes flying in? Watching their innocent laughter as they enjoy their time in a taxi and pointing out the Empire State Builing like the bunch of upstate goobers they must be, you’re worried for the Dude’s little boy! But you are also laughing because of how hilariously obvious and forced the situation is! And then when the horrible special effect crashes into the very top of the Empire State Building and we cut to a scene of a chunk of concrete falling on the taxi, you don’t know if the tears in your eyes are because you’re scared the Dude’s kid just got crushed or because of how funny the whole sequence was! 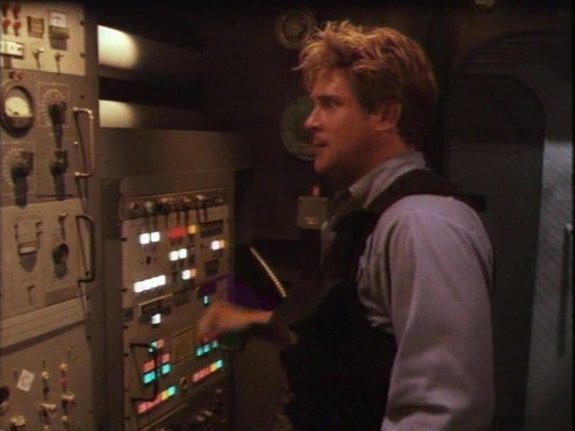 Crash Dive is 90 minutes of full fathomed entertainment uninhibited by the shackles of realism or creativity, it’s only mission to launch a Dudikoff-sized torpedo of economical action at an audience who has found memories of movies such as Chain of Command and The Human Shield.